Posted on August 29, 2018 by Betsy Jacoby-Greenleaf. It seems everywhere you look these days someone is trying to sell you the secrets to their success. There is always a catch, isn’t there? The truth is success rarely happens overnight. I’ve watched many trade show coordinators, invest in the wrong areas and focus too much on external things that aren’t as effective as they used to be. Below I’ll share what I’ve discovered through years of experience what you should concentrate on that can help steer you in the right direction if you are drifting. There is no “gotcha” in these secrets and I guarantee you that success will NOT happen overnight. 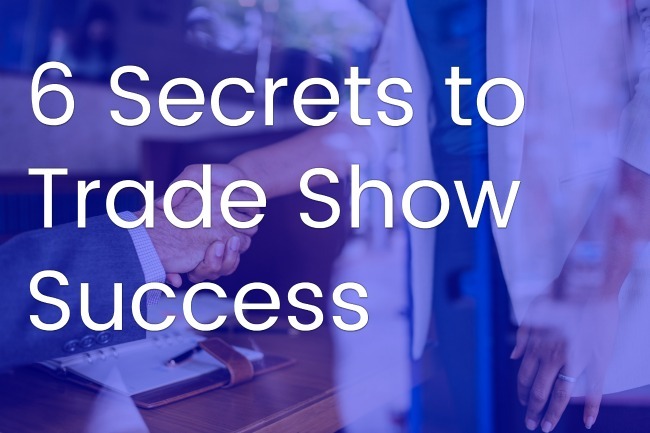 What I can pledge to you is this: If you work hard and incorporate some of the following strategies you should start to see a positive shift in the direction of your event. Relationship building is foundational to every area of our lives but when it comes to our professional lives we sometimes downplay how important those relationships are. In the event world, it would be a mistake not to seek out connections with others in your industry (or even outside of it). Nurture the relationships you currently have and build new ones through networking events or by joining a nonprofit. It’s a critical part of staying in the game. If you ignore relationship building you just might end up being benched. Transparency is a word that is talked about a lot these days. Flip on the news and I bet you’ll hear that word used a time or two. But what does it actually mean to be transparent in the business world? Transparency is all about open communication and building a culture around that. It means that if there are problems that need solutions, as a coordinator it’s your job to be open and honest about it. It all goes back to building those relationships because it’s so critical to the trust and transparency you’ve worked so hard to earn. One of the biggest mistakes I see is a trade show coordinator’s ignorance (willingly or not) when it comes to opportunities for growth. The events industry is evolving and burying our heads in the sand will keep us stagnant and small. One of the best opportunities for growth is embracing newer technology (that has been tested and is found to be reliable). Another mistake I see people make is ignoring the data. What industries have been increasing in growth? What is lagging behind? Research is vital for making informed decisions when it comes to being more profitable. I always tell people that you need information in order to diagnose a situation. A good doctor wouldn’t recommend surgery without running the proper tests beforehand. Similarly, a good trade show coordinator wouldn’t make any serious changes without first doing a profitability analysis for their client first. Once you identify all the factors you can then make the best-informed decisions for your client. Why is having a high retention rate so important to your success? Think about how much time it takes to build your relationships (and the hours of training). Time is always money. Maintaining a higher rate of retention comes down to building strong relationships by having good communication (transparency) while being data-driven instead of just going with your gut. Implementing programs designed to offer incentives and improve the experiences for your clients, exhibitors, etc should also be a part of your overall retention strategy. It’s been said that there is no success without shared success. This is common sense on a very basic level. If a client isn’t finding success through my leadership it’s likely that our professional relationship will end. Shared success is all about meeting the goals of everyone involved. For example, when suppliers and vendors exceed their goals they might be able to share their success with you by reducing your bill. You want those win-win situations. I’ve written on this topic many times because it’s that important to your success. Having a well-planned show means that you are prepared. You have crossed your T’s and dotted every I by paying attention to all the details. When you do this you can achieve that easy going show that makes people want to come back.